I found interesting two recent announcements about new natural gas vehicles. The first is a fleet of CNG limousines at the large multi-use CityCenter project in Las Vegas. 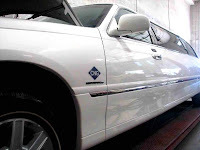 The limos are Lincoln Town Cars adapted by Krystal Enterprises. The second announcement concerns the new Freightliner natural gas truck that is being delivered to the Port of Long Beach, CA for the drayage fleet. The first five vehicles will be delivered soon and another 25 will be built in September. The trucks are being built at the company's North Carolina plant. The vehicles will work in and around the port so that they can be serviced by a single fueling station. It's nice to see forward-thinking companies promoting their wares. As the natural gas fueling infrastructure grows, these vehicles will be the first of many.